What is “Five Fruits” in this 1920s cocktail recipe? Keep the punch in the ice box for two hours before serving time, so that it will be thoroughly chilled. Pour over chopped ice in the bowl and serve at once. What exactly is "Five Fruits"? From context I infer that it's a sweet juice blend, maybe something like modern-day Hawaiian Punch; but I haven't been able to Google up anything about the name because everyone on the Internet wants to tell me about 1980s-era beverage Five Alive. It could be just the liquid or the fruit with the liquid. It has five fruits, Peaches, Pears, Grapes, Pineapple, Cherries. What exactly is "Five Fruits"? "From context I infer that it's a sweet juice blend, maybe something like modern-day Hawaiian Punch; but I haven't been able to Google up anything about the name because everyone on the Internet wants to tell me about 1980s-era beverage Five Alive." Due to the lack of historical data, it may be impossible to find out what exactly is "Five Fruits". 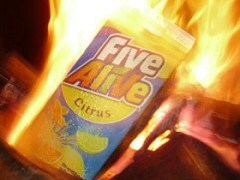 My own personal suspicion is that "Five Fruits" may be somrthing like the original Five Alive drink. 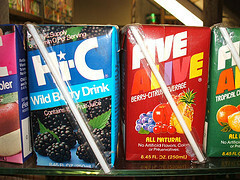 The “Five” represents the five fruit flavors in the drink. There has been a total of seven varieties, but the original was a blend of orange, lemon, grapefruit, tangerine, and lime. I have no idea what this combination tastes like; I’ve never had Five Alive. The memory I have of this product is entirely visual, etched into my psyche from a passing glance in a grocery store some 22 years ago. You can always use the modern Five Alive drink or Grenadine if you want. The one quarter cup in the recipe could be for either a syrup or a juice. A syrup would definitely make it more sweeter. Not the answer you're looking for? Browse other questions tagged history cocktails prohibition mixers or ask your own question. What cocktails are named, created or in some other sense may be used by Catholics to celebrate their liturgical year?